Bourne, an activist for social justice, Juno Award Winner and 8 time Juno Award nominee, has been critically acclaimed across the western hemisphere for his recordings and live performances. 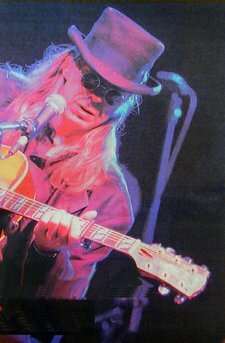 Bourne has a style so uniquely eclectic that his powerful rhythms and soulful songs arrive steeped in world beat, blues, cajun, celtic, folk, flamenco, funk, and so much more. The latest of his 10 CDs, Boon Tang, was released last year and proves that the man with the unclassifiable style is still capable of taking the listener somewhere he hasn’t taken them before. When you listen to his most un-reggae version of “No Woman, No Cry,” it is as if you are hearing it for the first time. Then we switch to a rhythm that evokes the Middle East and Orient. Bourne has also collaborated with many musicians such as Alan MacLeod, Shannon Johnson, and Eivør Pálsdóttir. Bill has been an important part of roots music for a long time. He was a member of Scotland's Tannahill Weavers for several years, with world renowned piper Alan MacLeod for a time, then with fiddler Shannon Johnson, blues greats Hans Staymer & Andreas Schuld, and most recently with Tri-Continental. His work with Madagascar Slim and Lester Quitzau (Tri-Continental) has been very well received on both sides of the Atlantic. Bill's current collaboration with Eivør Palsdottir of the Faroe Islands is a deep, and powerful musical union that is undeniable in it's shine and relevance. There are 12 recordings of this musical journey and an armful of awards and nominations. This explains who Bill Bourne is in one paragraph: Professional Musician,Vocal, Guitar, Harmonica, Fiddle, 30 Years Stage Experience Songwriter, Award Winning Recording Artist, Record Producer, International Touring Artist, Horseback Rider Since Age 5, Class 1 License with Air Brake Certification, Class 6 License Motorcycle, Licensed Diesel Mechanic, Recording Engineer, Handled Guns since age 14, Fly Fisherman, Carpenter, Electrician, Farmer, Father, Gardener, Visual Artist, Poet, Musical Collaborator, Social Activist, Guitar Teacher, 1988 Dodge Van, 1968 Lincoln Continental, 1969 Gibson Hummingbird, 1981 Martin D28, 2001 Fender Stratocaster, Violin of unknown origin, various percussion instruments, the love of many beautiful friends, both old and new.